This article originally appeared in Bloomberg. A Q&A with Tom Blanton, director of the National Security Archive, on the historical value of Hillary Clinton’s emails, the sins of Julian Assange, and what national secrets are really worth keeping. How much does it cost to keep a secret? Well, the U.S. government sort of has an answer: $16.89 billion. That’s how much it spent in 2016 to classify information that it deems too sensitive to be released to the public. Some secrets are worth keeping, of course — like how to cook up chemical weapons, for instance. But others, less so. 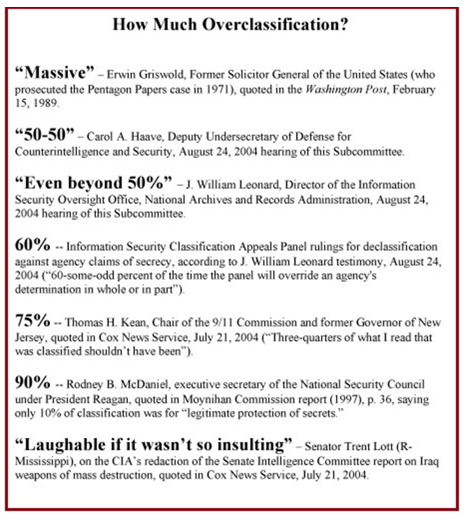 Rodney McDaniel, a top National Security Council official during the administration of President Ronald Reagan, estimated that only 10 percent of classification was for the “legitimate protection of secrets.” Former New Jersey Governor Tom Kean, a head of the 9/11 commission, said that “three quarters of what I read that was classified should not have been.” In fact, he argued that overclassification had left the U.S. more vulnerable to the 9/11 attacks. And that’s to say nothing of its everyday effects on government accountability and efficiency, congressional oversight and public awareness. Shortly after the government released a trove of documents on the assassination of John F. Kennedy, I sat down with Tom Blanton, the director of the National Security Archive, to talk about America’s dysfunctional mechanisms for classifying and declassifying information. Here, in an edited transcript, he weighs in on why historians should be extra-grateful for Hillary Clinton’s private server; what really needs to be declassified; and how history is likely to judge Julian Assange, Edward Snowden and Chelsea Manning. James Gibney: Tom, let’s start with the new Kennedy documents: Was there anything that changed the historical narrative in your mind? Tom Blanton: I don’t think the JFK release changed the historical narrative, partly because the U.S. is still withholding so much of it — stupidly. To me, the most striking thing about what did get released was why it was withheld from 1998 until now. It should have come out back when the JFK Assassination Records Review Board was doing its work. So much of the information was already available in other documents. When another several thousand documents come out in April, even with redactions, people are going to ask why it was held up. There’s this incredible level of absurdity in the classification system. We can show example after example where all it takes is one “securocrat” to override the better judgement of whole institutions. JG: If we were to do Declass 101, isn’t it the case that most material is supposed to get declassified within set periods of time? TB: It actually doesn’t work that way. The classified universe is so enormous, that basically classified records are going to stay secret unless somebody asks for them. Thanks to the National Declassification Center, there’s now a good process for pressuring the system from the outside. We’ve done it, other historians have done it. Ever since the Cold War, so much of the declassification effort has focused on the low-hanging fruit, to get numbers up. People have avoided tackling the hardest documents, like the secretary of defense’s files. His agency sits on top of most of the intelligence community, nuclear weapons, our deployments overseas. For historians, and for anybody looking for government accountability, you want the SecDef files. Yet that’s a really hard declassification target. We’ve argued for years that they should start at the top, because once you work through that body of records, all the derivative stuff just falls into place. JG: So, there’s no magical process by which those things that should be declassified by a certain time frame because of laws on the books actually do get declassified. TB: Yeah, there are no magic wands. Steven Garfinkel, who used to run the Information Security Oversight Office, the government’s internal watchdog on classification, once described coming into a Sensitive Compartmented Information Facility, or SCIF, that was wall-to-wall with boxes dating back to the 1920s, ’30s, ’40s, ’50s. He took about an hour and sampled stuff and then waved a wand and said, “let it go.” Few people within the government are willing to take that level of responsibility. But with the tsunami of electronic records that’s coming, the idiocy of this page-by-page, line-by-line review is a total failure. The backlog is enormous, and it’s only growing. JG: And as you’ve noted, a lot of the email traffic isn’t even being logged and stored. TB: Part of that was a deliberate government decision back in the 1990s. We brought the original lawsuit to force Presidents Reagan, George H.W. Bush and Bill Clinton to save White House email. We won. But when we tried to expand that principle to the rest of the government during the 1990s, the so-called decade of openness, the government fought tooth and nail. We only found out because of the Hillary Clinton email business that no secretary of state has systematically saved their email, until John Kerry did. JG: Isn’t it true that as a result of Clinton’s private server, we have a lot more of her emails than we would otherwise have had? TB: Yes, much more than if she’d stuck with state.gov. are you that there’s a lot of stuff for which there’s going to be no written record? TB: There’s a huge debate over this among historians. Michael Beschloss, among others, has argued that we ought to encourage presidents to tape every conversation and give them a guarantee that nobody will ever look at it for 20 or 30 years, because he so regrets that after Richard Nixon, no president is taping their stuff. 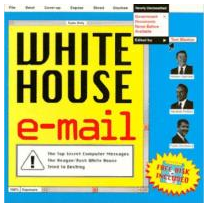 Tony Lake, when he was National Security Advisor, had me in one day to sign copies of our book “White House E-Mail“, which came out of our lawsuit. I thought it was a nice gesture by a former board member. I said to him, “Tony, it’s so great you’re really standing up for openness in the federal government.” He said, “Oh no, I’m giving copies of your book to my people so they never ever write emails like these.” He told me that because of the threat of subpoenas and congressional pressure, he went in to brief the president with just an index card. But as his deputy Nancy Soderberg — who’s now on our board — pointed out in the same conversation, after every meeting, there’s a vast electronic tasking process. So by the end of the day, there are probably hundreds and hundreds of email messages and taskings that are a record of those conversations. The net effect is that there’s a much wider electronic record of almost every decision the government takes today than there was in, say, the telephone era. JG: So, you don’t think this is the problem it’s made out to be. TB: You can’t run government or any major organization without writing stuff down. You can’t run a military command that way. Some of the most useful documentations that we get loose are coming from the military, because they have to write up their lessons learned at the end of their tours. They have a center at Fort Leavenworth on lessons learned, and those documents are huge, they’re really key for any of us to grasp what really happened in the Iraq War, what happened in the surge in Iraq, what mistakes the U.S. made, for example. JG: Don’t you think, though, that at least among political operatives, partisan polarization is going to make this threat worse? That officials are now so worried about fishing expeditions by the opposing side that they’re not going to record the sensitive stuff? TB: If anything, the technology is pushing in the opposite direction. Our real issue as historians is going to be sorting through a practically infinite body of evidence. We’re going to have to use algorithms to do it. JG: I wanted to return to some of the issues raised by the Kennedy assassination records release. It loomed so large in the American psyche. At the same time there are a lot of other events in world affairs where we’re still waiting for the smoke to clear to get some sense of what happened. What’s on your declassification wish list in that regard? TB: The wish list that we talk about involves large record groups rather than specific mysteries. We try to drive a systematic approach by the declassification authorities. The CIA, for instance, has put its internal clandestine service histories off limits. They now call them operational files. But they’re actually histories. We still have a lot to learn about past clandestine operations. Some of it has come out in the State Department’s Foreign Relations of the U.S. series, but only a small fraction. The CIA has actually done a pretty serious job of examining its covert ops and compiling lessons learned. But since most of it is so highly classified, a lot of people in the agency itself aren’t even aware of that history. And they’re not taking advantage of the back-and-forth they could be having with outside scholars and analysts. I mentioned earlier the secretary of defense’s files. Same with the secretary of state’s files. Or the files from the department’s Bureau of Intelligence and Research. It’s unique. Their analysts aren’t beholden to any one source, they’re all-source, and they’re dedicated to informing the secretary and high-level diplomats. Their products on the Vietnam War are absolutely the most astute that anybody in the U.S. government wrote, we now know. JG: Have they declassified the secretary of state’s Morning Summary, the daily all-source intelligence digest that INR produces? TB: Not in any systematic way. One of the bodies of records that we’re going after now, because relations with Russia are so in the news, is who said what to whom in the 1990s on things like NATO expansion. Strobe Talbott was one of the most vigorous and active writers. TB: He’d write “night notes” to Secretary of State Warren Christopher or Bill Clinton, and then get up at 3 or 4 in the morning to produce policy memos. It’s an amazing record. He was the interlocutor for just about every high-level, in-person meeting involving Russia. But those records aren’t accessible yet. And they should be, because of this long-standing Russian sense of grievance about NATO. JG: I bet you a box of doughnuts that Strobe has all those at home. TB: Exactly, but with no classification stamps on them. There are bodies of records like those — including records of briefings to presidents by national security advisors at the presidential libraries — that deserve a huge priority. I went down to Bush 41’s library at Texas A&M for the first time in 1998 with a copy of Mikhail Gorbachev’s transcript of his talks with Bush at the Malta Summit and filed a Freedom of Information Act request for the American version. It took 10 years to get it declassified. We try to bring that kind of cross-pressure to bear. Helmut Kohl, for instance, published all his documents on German unification, including personal letters from Jim Baker and George H.W. Bush. He never asked them. He just published them. So we used those as an opening wedge. Bodies of records like that need prioritization with the limited resources that the U.S. government has for declassification. JG: You must have encountered requests from other countries to help resolve certain things based on documents you’ve already unearthed. TB: Absolutely. One of the first delegations was a bunch of Hungarian dissidents who visited our archive in 1989. We had documents — CIA and State Department reports, for instance — on the Hungarian revolution in 1956. For these people it was like filling in the blank spots in their memories. I ended up in Hungary about three years later helping them write a freedom of information law. That dynamic continues today in 40 to 50 countries. 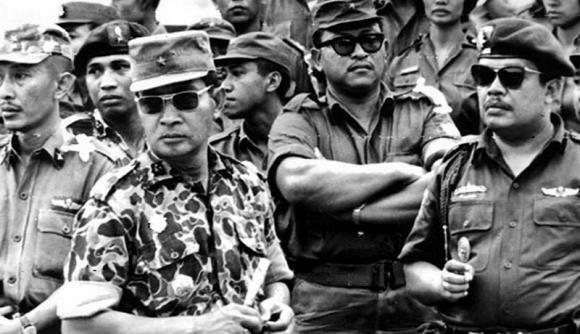 We just did a big release in which we helped the National Archives digitize documents from the U.S. Embassy in Indonesia dating back to that country’s genocide years, 1965-66. It made a huge splash in Indonesia. It gives granular detail from U.S. consulates in Aceh and elsewhere on the Indonesian military’s killings of leftists. Indonesia still hasn’t really faced up to that. JG: Have there been instances where you’ve teamed up with like-minded organizations in other countries to bring collective heat on one area or issue that you think really needs attention? TB: Sure, we teamed up with Polish dissidents to figure out what happened during martial law. Why did the Soviets not invade? 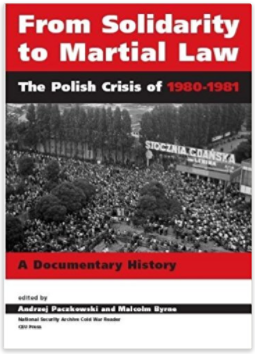 Why did the Poles refuse to do martial law in 1980 under President Jimmy Carter, and then do it under Reagan? Andrzej Paczkowski of the Polish Academy of Sciences dug out the Polish Politburo files, because they’re open, and the Polish secret police files, because they’re also open. We did some big events with them where we brought together the then-head of the Warsaw Pact with the head of Solidarity and even former prime minister Wojciech Jaruzelski, because he wanted his voice on the record. This helped drive a declassification process in Moscow, in Warsaw, in some of the other Warsaw Pact countries, and it helped us to go back to the CIA and get messages from Ryszard Kuklinski, a high-level U.S. spy, declassified. That’s the kind of thing the CIA would have never done otherwise. Right now, under the radar, the U.S. is declassifying files from Argentina’s Dirty War in the late 1970s — something that started under Barack Obama and that President Mauricio Macri recently asked Donald Trump to continue. JG: Did that actually come up in their talks? TB: Yes, we played a small role, suggesting to the Argentine embassy here that they put that on Macri’s talking points, and we let the career people here know. In Argentina, more than 100 trials are ongoing against various members of military units for “disappearing” people. It’s invigorating Argentina’s own justice system. JG: Are there any places or issues where you’ve received requests for help from other countries but gotten no traction with the U.S. government? TB: Most of these requests aren’t easy. Look at what happened with the Chilean dictator Augusto Pinochet. We were filing freedom of information requests on that from our earliest days in 1985 and mostly getting shafted. But then the 1988-89 Chilean transition to democracy took place. Under Clinton, it became U.S. policy to open up some of this stuff. When Pinochet was arrested in London in 1998 we got another big chunk. But not until October 2015 did the State Department hand over the internal documents that Secretary of State George Shultz had used with Reagan in October 1987 to convince him to stop saying nice things about Pinochet — including evidence that Pinochet had personally ordered the assassination of Orlando Letelier in Washington. It’s been a bit at a time. The secrecy system is not a rational one. It only responds to pressure. JG: In some of your writings, you talk about how the post-Cold War period ushered in greater openness that led to the passage of laws in numerous countries to promote disclosure and transparency. TB: There are now about 115 countries with some legal provision giving citizens right of access to government documents. JG: So, who’s doing it right, if you’re thinking about best practices or role models? TB: The best freedom of information law, one that’s having a huge impact in a country that’s a running disaster, is in Mexico. It’s far superior to our law, because it has a human rights override. You can claim national security as a reason not to declassify something, but if it’s about the actual torture or disappearance of somebody, that exemption is not available. You can claim it’s an ongoing law enforcement operation, but if it’s a crime against humanity or a massive human rights abuse, the attorney general is compelled to turn documents over. JG: And yet… Ayotzinapa, the still-unsolved disappearance of 43 students in 2014. You got this great law, but you still have this terrible situation. TB: That is an incredible situation, but Mexico’s system also has a tribunal that can override even a cabinet official. This independent body has overruled the attorney general, including in the Ayotzinapa case. It forced him to release files which then supported the conclusion of an international panel of jurists that there was a cover-up. That’s not enough to turn a corrupt system around. But it’s an interesting lesson for us. JG: What about the Interagency Security Classification Appeals Panel, or Iscap, in the U.S. system? Doesn’t that work? JG: Switching tracks a bit, has WikiLeaks made your job easier or harder? Are they competition or a complement? TB: They’ve made it harder because they’ve made the government so much more paranoid, and more likely to protect stuff that doesn’t need to be protected. One of the lessons from the 257,000 diplomatic cables WikiLeaks threw up on the wall with ultimately almost no redactions — well, I asked Michael Posner, who was the assistant secretary for democracy and human rights, about what real diplomatic damage they caused. He wouldn’t tell me until his retirement party, when he said that part of the cost was that the U.S. was forced to withdraw some of its ambassadors. But the real cost was the time that was spent reacting to them, including the time it took to warn and protect some sources. That kept diplomats from doing other, more constructive work that they should have been doing. I’ve had a lot of big arguments on the WikiLeaks front. They’re still covered by the First Amendment, even though I really disagree with Julian Assange’s notion that he and only he should have the power to throw things up on the wall. There’s also his denial of the idea that there are real secrets. Any common-sense person would recognize that there are real secrets, pieces of information that you want the government to hold close. You don’t want the banditos to know how to build a binary chemical warhead. Bingo. That’s a real secret. You don’t want to release anything that’s going to get anybody killed. You shouldn’t release our government’s bottom line in a negotiation before the negotiation. I think that’s a relatively small fraction of the classified universe, maybe no more than 10 to 30 percent. And even those secrets only need to be protected for a certain period of time. I had this argument at Texas A&M recently when I defended Edward Snowden. I said that unlike Chelsea Manning, who just dumped what she got, including documents that exposed Afghan villagers to potential death, Snowden worked with a core group of journalists who pledged to screen and vet documents. He didn’t just throw stuff against the wall, and he didn’t just give it to WikiLeaks . By my count, the intelligence community has now declassified more pages of Snowden-related surveillance documents than Snowden’s media partners have published. As national security officials such as James Clapper and Chris Inglis have admitted, they made a huge mistake in keeping that stuff secret. It just reduced U.S. credibility. The jury is still out on what Snowden did. Some of what he has released could still end up killing somebody. And if that happens, the balance changes. But right now the Snowden leaks are very much on the side of reforming the surveillance system and telling people — not least Congress — more about what’s going on. JG: So what are the two or three things that would make the declassification ecosystem work better? You’ve talked about some of the shortcomings. What is it you want that you don’t have to make this system work better? TB: I would love to have more high-level focused mass declassification efforts, like the JFK Assassination Records Board. Congress hasn’t stood up many more. They created one on Nazi and Japanese war crimes that had a huge impact by opening up clandestine files about the Nazis we brought to the U.S. and protected. They beat down the intelligence community. Our board warned us at the outset to stay away from assassinations and UFO’s. Too many people wearing tinfoil hats, not to mention plenty of hobbyists and independent scholars working those issues. They don’t need us doing that. They need us focusing on things like nuclear targeting, where it can take 10 years to get things declassified and have immense global significance. But because the JFK records board took an expansive view of its role, they broke open all sorts of records about Cuba that were essential for historians, for Obama to make his Cuba policy change. JG: But any such new panels would have to have focal points. Where do you want them to focus? TB: I would love to have a panel like that going after the CIA’s clandestine histories. The National Declassification Center is not going to pick a fight with the CIA to go after those. But they are key to demystifying CIA operations. That may be why they resist doing that. You get close enough to these covert operations and you often see what absolute disasters they were. I’d love to see Congress stand up a powerful Iscap or a more powerful Public Interest Declassification Board. Why weren’t all the supposedly classified Hillary emails sent to Iscap, so an interagency body looked at them, instead of one securocrat making the decision that they’re classified? We need more third-party levers. If you move the decision out of the cold dead hands of the originating agency, and into an independent body with some leverage, wonders may never cease.